In this post we examine 5 of the best-selling glow in the dark paints. Before we dive in, if you're looking for a luminous paint for DIY indoor/outdoor wood, glass, metal, paint, fabric, plastic applications, check out the Aurora paint. If you want a body paint, check out the UV Glow paint. The Aurora, DecoArt, Glominex and the Astro Glow glow after seconds of exposure to light. The UV Glow is best for a nightclub environment with UV lighting. Glow in the dark paint is a fantastic way to add flair to any home or work of art. If you want it to glow, one of these paints will certainly meet your needs (Source). From ceiling stars to fantasy designs, there's a world of inspiration at your fingertips- just check out Pinterest. 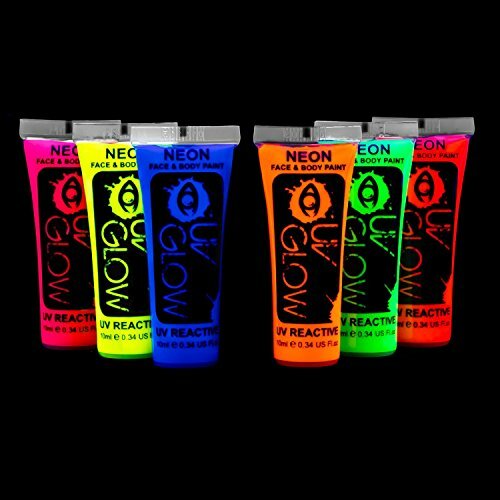 Customers had several tips for new users of glow in the dark acrylic paint. First, don't use as much paint as you're used to; a little goes a long way (Source). When you do have to do an extra coat, allow for 15-20 minutes of drying time between them. Remember, extra coats add brightness. Finally, be creative! These glow in the dark paint wall murals are only limited by your own ideas! Out of the paints we are looking at, though, what is the best glow in the dark paint? Well, each of these options have their merits and downfalls, so let's take a look! First, these paints vary by whether they water-based or acrylic. Water-based paints are more popular today thanks to them being generally non-toxic. Acrylic paint isn't bad for you, though, and it tends to dry faster (Source). Options such as the Spacebeams products are water-based and DecoArt is acrylic. There are also body paint options. On this list, UV Glow Blacklight Face and Body paint is the option to go with. These are fantastic for Halloween, parties, and even concerts! Since they are for your body, they also come in fluorescent, eye-catching colors. It is important that you use this product and not other interior glow in the dark paints for use on skin. The Astro Glow option is also unique since it comes with an accessories. That is a small UV light that is for "charging" your paint for when you are ready to use it. It promises to "supercharge" your paint by comparison to sun exposure! Another difference is how this paint dries. Options like the Astro Glow glow in the dark paint dries clear. Yet, an option such as the Glowminex paints dry in their distinctive bright colors. The SpaceBeams Aurora Bright Paint is a solid option if you are looking for recreate beautiful memories from childhood. Users like the brightness of this paint, but do complain about its texture and the price. This product features top grade europium-doped aluminate oxide pigments in durable and ultra-adhesive acrylic solution. It is ideal for use on a wide range of surfaces (wood, glass, fabric, metal, plastic, etc. ), both indoors and outdoors. The paint glows all night after a 10-second light charge (best with a UV flashlight). This item seems like a solid choice if you want a non-toxic, non-flammable, water-based paint which gives off a very vivid bright green fluorescence in the dark. The general user consensus concerning the SpaceBeams Glow in the Dark Paint is that it is very durable and easy to apply. Users agree that it shines very bright when charged. However, some buyers complain about it being gloopy and hard to spread. Some complain that for the same money you can get larger vials of glow paint. Several purchasers share that the paint arrived completely congealed. The DecoArt Glow-in-the-Dark Paint is a solid option if you want to add a luminescent effect to craft projects. Users like the luminescence of this paint, but do complain about too many coats that are needed for it to glow. This product adds luminescence to most surfaces (fabric, wood, plastic, paper, styrofoam, candles, walls, pumpkins and ceramic bisque) when charged with light. It may be used alone or mixed with lighter colors or acrylics. This item could be a solid choice if you want to mark children’s clothing, make interesting Halloween crafts or decorative painting highlights. In general, users have a favorable opinion of the DecoArt glowing paint.They agree that it is easy to clean, charges quickly and dries on clear. However, some buyers complain about it being very thin, which is why you need to put many coats to make it glow in the dark. One disappointed buyer complains that no matter how many layers she put on it or how many hours she let it sit in the direct sunlight, the paint is not bright and doesn’t stay lite for longer than a couple of minutes. Make sure the area you are working on is clean. Like any other type of paint, you want a smooth coat. Do not apply to a dark background. Prime your area with white or another light-colored coat. Try to do your work under a UV light. This will "charge up" the paint so it will glow later. Keep the number of coats around 2 or 3. Your glow in the dark paint DIY will glow this way without wasting paint. Remember, the more coats you use, the harder it is to control how smooth the paint job is. Leave 15-20 minutes between coats for drying. Spray Epoxy protector on the piece for extra durability. Don't be afraid to experiment to get unique results! If you are looking for a glow in the dark paint which adheres well to plastic, wood, metal and fabric, you might want to consider this one offered by Astro Glow. 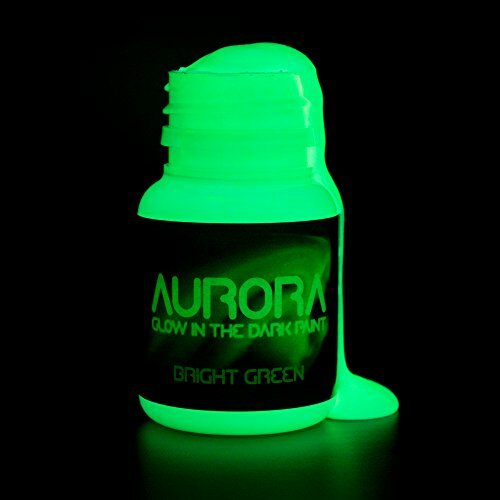 Users love the brightness of this glowing paint, and so far only one buyer complains about receiving a defective item. This product is made from the highest grade Strontium Aluminate pigments which means you get the brightest and longest glow effect in an extremely durable paint. It’s non-toxic and non-flammable and easily cleans up with water. The paint dries virtually clear and is nearly invisible on light colored surfaces. This fluorescent paint might be a solid choice if you want a bonus UV charge light to quickly charge the paint. 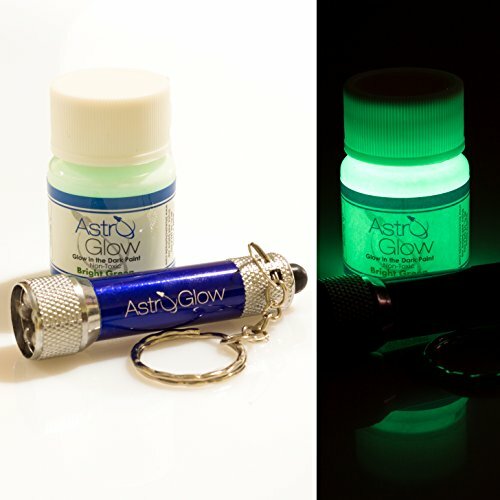 In general, users have a favorable opinion of the Astro Glow Non-Toxic Paint and they agree that it glows very brightly. They find the included UV light to charge it super quick. So far, only one purchaser we spoke with complained about receiving a broken UV light. 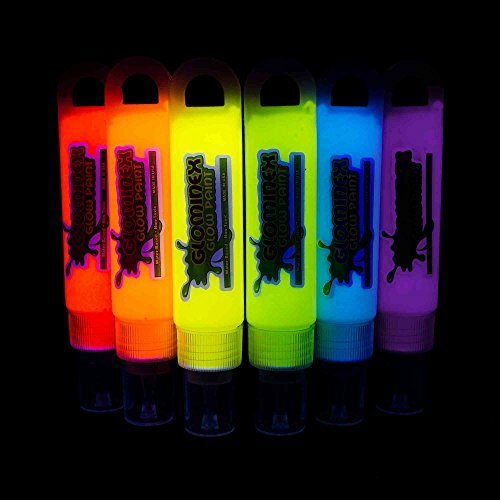 If you are looking for a top-rated UV glow blacklight, you might want to consider the UV Glow paint. Users love the quality of this face paint but do complain about its consistency and excessive drying feature. This set includes 6 vivid, bright neon colors that give off an immense fluorescent glow under UV lighting/blacklights. These paints apply easily, dry quickly on the skin, last all night and wash off easily with water. The pack includes pink, orange, red, yellow, green and blue paint. This item could be a good choice for clubbing, festivals and anywhere with UV lighting. In general, buyers are pleased with the UV Glow Face & Body Paint. They appreciate that the colors are long-lasting and easy to take off. Users agree that they are perfect for glow in the dark party with black fluorescent light. However, some buyers say that they are tricky to use due to a gel-like consistency. One purchaser we interviewed shares that their super drying feature doesn’t make them so comfortable on lips. The Glominex Glow in the Dark Paint is a solid option if you are looking for a paint that glows in the dark and looks like regular paint in the daylight. Users love the bright colors of the paints, but some do complain about too much time needed for them to charge. This pack includes 6 assorted tubes with 1 ounce (30 mL) of non-flammable, acid-free fluorescent paint. The product is not recommended for use on skin/hair. If you are looking for a glowing paint for crafting projects, this might be a solid option. In general, users are happy with the Glominex Glow in the Dark Paint. They state that the bright colors are great for many art projects. One user suggests applying the paint generously, otherwise it can form cracks. However, many buyers complain about them taking a while to dry. They add that the paint only shows up after hours of light exposure, if even then. Several purchasers state that the tubes arrived hard as a rock. Since we carefully selected five of the best-selling glow-in-the-dark paints, it only makes sense that we outlined some best practices for using this unique, glowing paint. 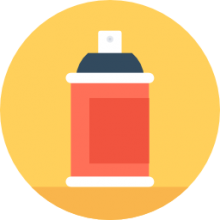 Consulting some art websites, we discovered that, in their opinion, this type of paint does require some skill and practice before you get the best outcome from it, especially if using a paint sprayer. The first point they made is that the first few coats will look invisible to the naked eye- so get used to that! The next tip they shared is that you should get used to using less paint than you generally apply. So when you dab some on your brush make sure that you make an effort to spread it out as thin as possible and only supplement it when absolutely required. The reason for this is it will help you to avoid bumps and raised edges that will glow brighter than the rest of your brush strokes. You will also want to invest in either an ultraviolet flashlight or a black light so that you can spot check the evenness of your brush strokes while they are wet. As we mentioned, because this paint will be clear, and you really can't see what's going on with it with the naked eye, you'll want to check it every so often with the black light or the ultraviolet flashlight to ensure that there are no raised edges that will glow unnecessarily brighter. Thankfully, though, as you get a hang of the amount of paint required for a smooth stroke you don't have to use the spot check lighters as frequently. Another helpful tip is that between coats you should wait 10 to 15 minutes for it to dry. The reason for this is that if you end up waiting only 5 minutes, for example, before layering on the second coat it will actually remove the first coat's glow. Perhaps you are painting a sign design to be highly visible- in this case, you want to achieve optimal brightness. You can reach for maximum brightness by layering on more than one coat of paint-though it's counseled that after the first three layers it won't make much of a difference. If you're really ambitious and want to sketch three-dimensionally you can employ toothpicks and toothbrushes to create some visually arresting aesthetic effects. This is often great for replicating outer space environments. The way it works, you'll be dipping your toothbrush or toothpick into different colored glow paints and basically flicking stars on to your canvas. There are even glow powders you can use! One additional tip is if you are feeling stymied, head over to Pinterest and search for fun project ideas you can experiment with. The editors over at wikiHow.com even have a tutorial for how to make glow-in-the-dark paint. The way it works, you'll purchase some dark powder from an art supply store, select some clear gel or paint, add the phosphorescent powder and the paint in a small bowl, stir it up and then use immediately. The phosphorescent powder will come in different colors and will often have different particle sizes. When you're selecting, be aware that a larger particle will make it look lighter, but provide a more speckled appearance while smaller particles will have a smoother effect, but not as powerful a glow. There's even a strategy for using a common fluorescent highlighter mixed with water and cornstarch to create a glowing effect. This might be a fun DIY project but for more professional home decor purposes you'll probably want to buy an expertly mixed can of paint.